When everything is moving so fast, life is hectic, work is demanding, relationship needs to be nurtured… sometimes I feel suffocated, do you? Well these are part and parcel of urban stress that we are facing. In order to keep up with the pace we have to find our balance, for me I love to get close to the nature, inhale the fresh air, relax and refocus my priorities. I am glad that over the weekend we had fun outing and picnic early in the morning at Taman Rimba Bukit Kerinchi which is just 10-minute walk from Pantai Sentral Park. It really enlighten my mood after that. 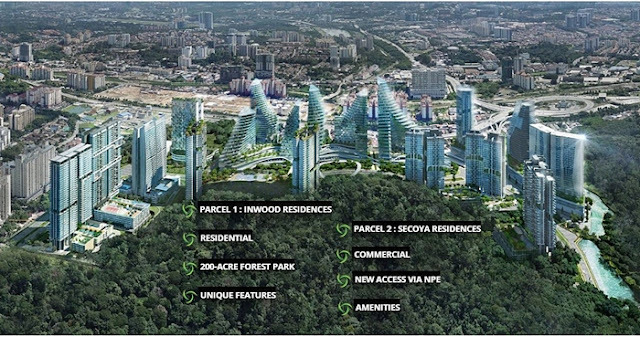 I can imagine if I were to live at Pantai Sentral Park which is next to a 200-acre forest park stay; I will be able to go picnic more often with my family and friends and also go for my regular run or jog or even hike at Taman Rimba Bukit Kerinchi. Do you know that Pantai Sentral Park is Kuala Lumpur’s one and only urban forest city? Get the best of both worlds, the lush greenery, accessibility, infrastructure and strategic location that connects to all the lifestyle amenities in the city. There are not many developments so near the city centre that have the luxury of greenery like Pantai Sentral Park. I have visited their Secoya Residences showroom before; the layout, design and concept the township is nature-centric, sustainable and safe city to live in. In terms of accessibility, Pantai Sentral Park is directly connected to New Pantai Expressway (NPE) which link to the city centre, Bangsar and Sunway. Plus it is next to Federal Highway, LDP, KL-Putrajaya Expressway, Kerinchi Link and many more. Accessibility is definitely a plus point on top of that it is also near to University Station LRT and Pantai Dalam KTM; the future proposed Circle Line MRT will be coming soon. For those with children and elderly parents will also have a peace of mind because there are a few reputable international schools nearby and also hospital. Overall, I am awed by the lush urban forest park which is so near the development. These will enhance the quality of my life by spending more quality time with my family outdoor doing healthy activities. Since it’s so near the city centre, I can save time on my travelling to work every morning. I dunno got such lovely nice place in kl city.. Can go kai kai there d.. The venue is nice. Can picnic with family in weekend. Can relax a bit in nature. I like this urban forest concept as well. Close to nature, yet not far from the conveniences of city life! We need to have more of this urban forest around so that we could share the beauty of it with our future generations. Thanks for your recommendation. I will add this city park anf it looks humbly beautiful. Doesn't know got this park, so nice and relaxing.